Last year I met this really cool little 11 year old ripper who I think should get big props for taking on those big Oregon bowls. She's been skating 3 1/2 years. Her name is Zea and here's a little bit about her life growing up surrounded by all those great skateparks. S) Why skating? What I mean is, why do you skateboard when you could be doing other sports, activities, etc.? Z) I didn't have a choice in the matter. I said "girls can't skate" so my dad made me, Kyla, and Mom start skating. S) What's it like to have a family who loves skating as much as you? learn new tricks and we encourage each other. S) Do you feel your parents are skate role models for you and Kyla? 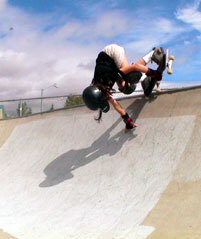 Z) My dad is because he is liked by a lot of skateboarders, and my mom because she encourages girls to skate. S) Describe the skate scene in Eugene. Z) There are older guys and bikers that are supportive of the skaters. Everyone is friendly and if someone is mean to younger kids they get yelled at by the older skaters. S) Do any of your close friends skate? Z) None of my school friends skate, but I have made friends that are just as nice that skate. S) What is it about skateboarding that makes you keep doing it? Z) All the boys I know that encourage me to keep skating. S) If you could choose to skate anywhere in the world, where would you go? Why? Z) I would go to Australia or some place were people have the cool accents. S) Tell us a little something about what your life is like when you're not skating. Z) I love reading and am crazy about animals. I love cats and horses a lot. I like drawing. I want to do track. S) What are your favorite tricks? Z) Grab airs, and handplants. S) What is your most memorable experience/occasion? Z) Dropping the 9 ft. bowl at Churchill. S) What is your favorite music, color, sport, etc.? Z) I love green, skateboarding, and almost all music. S) Who are your sponsors? S) What do you think about where girls' skateboarding is at now, and where would you like to see it go in the future (skaters, media coverage, events, etc.)? Z) I think more girls have started skateboarding and it will continue getting bigger. S) Where do you see yourself 5 years from now? Z) I can't see that far ahead because it depends on what happens from now until then. If I continue skating I think I will be good. Cal Young1st/ boys division, Summer 02. Roseburg Contest3rd/ boys division, Summer 02. Harvest Boards Contest2nd/ boys division, Winter 02. RAS contestCal Young2nd/ boys division, Summer 03. Round Robinall parks in Eugene, all ages 7th/16, Summer 03. Harvest Boards Video Contest2nd, Summer of 03. Boardsports at Cal YoungFall 03. Harvest Moon at Bethaltied for 3rd, Fall 03. Springfield2nd place girls, Summer 04. Boardsports at Cal Young2nd place girls, Summer 04. Real Skate Copyright © 1999-2004 by Clarkie, Santa Cruz, CA. All rights reserved. No part of this publication may be reproduced by any means; electronic, mechanical, photocopy, or otherwise without the prior written permission of the copyright owner, photographers, writers, or artists named herein. Trademarks mentioned herein are the property of their respective owners.